Long before the Oculus Rift was even a twinkle in Palmer Luckey’s eye—before the headset’s developer was even born, actually—I was plunking down $3.50 at the Century Theater in San Jose, CA to see 3-D classics like Metalstorm: The Destruction of Jared-Syn, Friday the 13th Part 3-D and Jaws 3-D. Don’t judge. It was the early ‘80s and these films were some of the first to incorporate the then-cutting-edge immersive film technology of the day: anaglyph (“red-blue”) 3-D. Were these films great? Not even a little bit. But they were undeniably bold technical leaps forward in pursuit of a more immersive viewing experience. Three and a half decades later, immersive technology has finally emerged—for real this time—as a powerful and exciting new form of storytelling. And for the first time ever this year, the LA Film Festival presented a showcase of immersive storytelling from visionary creators working in the often-intersecting fields of augmented reality (AR), mixed reality (MR) and virtual reality (VR). The program—The Portal Immersive Storytelling Showcase, curated by Festival Guest Director Jacqueline Lyanga—was free to the public and was presented in partnership with the Loyola Marymount University School of Film and Television, taking place at the brand-new LMU Playa Vista Campus between Saturday, September 21 and Sunday, September 23, with a special opening event on Friday, September 2o that also serves as an introduction to the Peggy Rajski, the new Dean of the LMU School of Film and Television. . 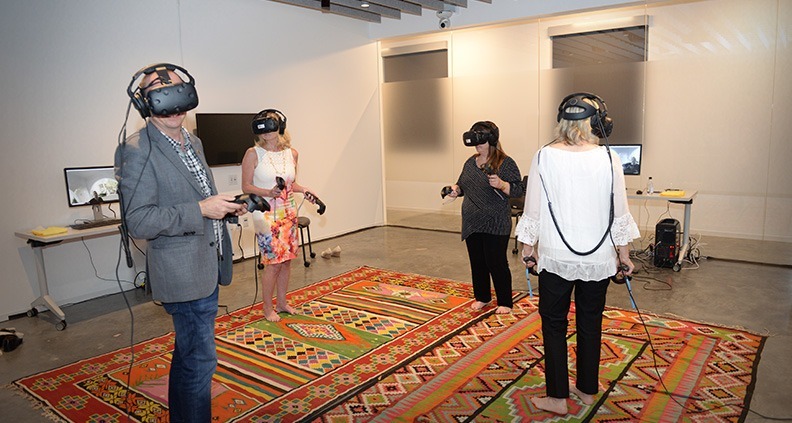 The Portal offered attendees the opportunity to dip their toe into the world of immersive storytelling. Although it may be more accurate to compare the experience to one of those team-building exercises where you close your eyes and fall backwards, trusting others—the filmmakers in this case —to catch you. But here instead of simply catching you, they transport you into the middle of a variety of breathtaking situations and beautifully realized worlds, some populated by characters whom it’s even possible to interact with. Ever wondered what it would be like to climb the side of a sheer rocky cliff with nothing to save you from plummeting thousands of feet to the valley floor below? Or venture deep into the Amazonian forests to witness a shaman perform mystical ceremonies? 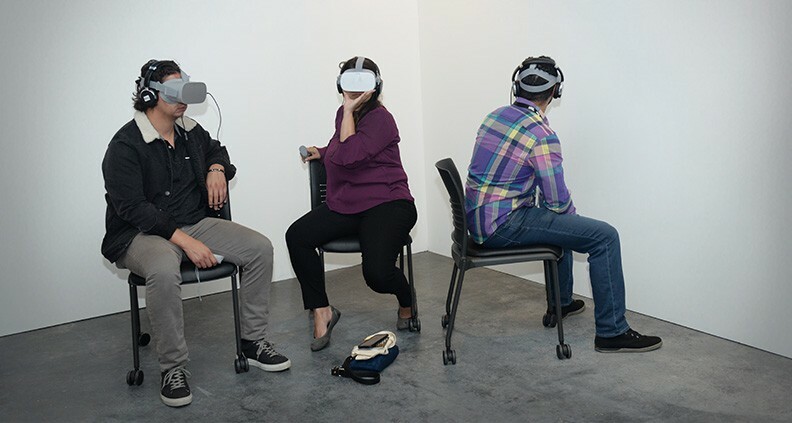 The technology on display at this year’s LA Film Festival offered a “portal” into those and many other unique immersive experiences. I’m a huge doc fan, so my first stop was a room showing a slate of four short docs: Free Solo 360, Into the Now, This is Climate Change: Fire and The Sun Ladies. I sat down, and one of the Portal’s many helpful Festival volunteers strapped an Oculus and onto my head. Within seconds, I was dropped into a movie experience unlike anything I’d ever seen before. For about 45 minutes my head was spinning—and I mean literally. The films ran between seven and 15 minutes each. As I watched each doc, I continually swiveled my head in every direction. I’d look up and see a hammerhead shark thrusting through the water right above me. Looking down from a dizzying height, I watched world-famous free solo climber Alex Honnold clinging without safety ropes, picking his way up the sheer face of El Capitan. I’d turn all the way around in my seat to look behind me to find a Cal Fire crewman just inches from my face. It was an emotional ride. I felt dizzy, scared and elated. As I watched homes reduced to ash or witnessed stoic female soldiers drilling for combat, I could feel a well of emotions bubbling up in me. Just about the only things I couldn’t feel were the wind, the water or the heat. In the end I walked away convinced that VR is a perfect medium for nonfiction storytelling. Typically, it takes time for a viewer to accept and connect to a film. A viewer needs a little while to connect with a film’s subject matter and hopefully build empathy for its lead characters. But immersive storytelling is a supercharged form of filmmaking that accelerates this process. The effect is profound, and surprisingly quick. On Saturday, the “Women’s Voices in VR” panel discussion included Dr. Courtney Cogburn, director and producer of 1,000 Cut Journey, Illya Szllak, director of Queerskins: A Love Story and Emmy Award-winner Lynette Wallworth, who produced and directed the mixed-reality tale Awavena. Each artist talked about what led them to immersive technology as a medium for their work and gave insight into their goals and results. Most interesting was a discussion regarding how experiencing immersive technology is a profoundly different experience from someone watching a traditional “flat” film. Based on my experience this weekend at the Portal, and it’s clear that a whole new language in storytelling is currently being developed by ambitious, visionary creators. There will be more challenges to overcome, like developing a successful distribution model. There will be debate on the ethics and responsibilities of artists and producers to ensure a safe experience for audiences. But without a doubt, experiencing immersive technology is not the same as watching a movie—it’s like walking in someone else’s shoes. And I look forward to trying on a multitude shoes in all kinds of shapes, sizes and colors. To check out a complete, detailed list of projects from this year’s inaugural edition of The Portal Immersive Storytelling Showcase at the 2018 LA Film Festival, just click here. If you missed it this year, we have good news! 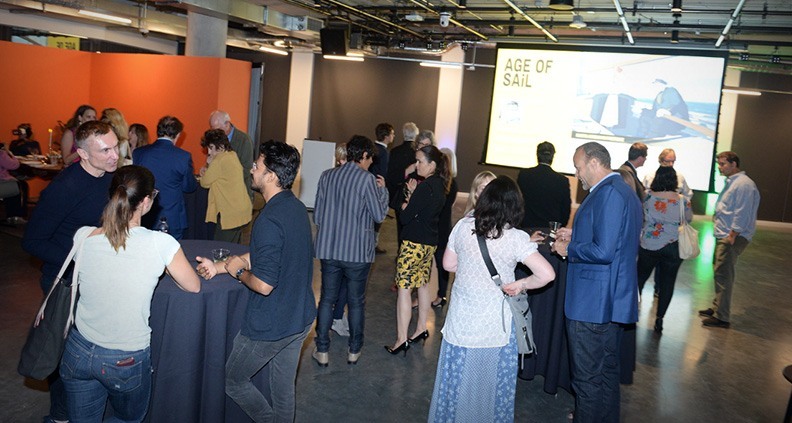 The Portal is already planned to return as part of the 2019 LA Film Festival, in partnership with the Loyola Marymount University School of Film and Television.